North Carolina's extensive ferry system provides access to some of the most beautiful coastal destinations in the country, but riding a NC ferry can add some fun to almost every trip. From its origin as a private Ocracoke ferry service, the NC ferry system has grown to seven routes with 22 ferries and over 400 employees. Over one million cars a year are safely ferried across coastal NC waters. 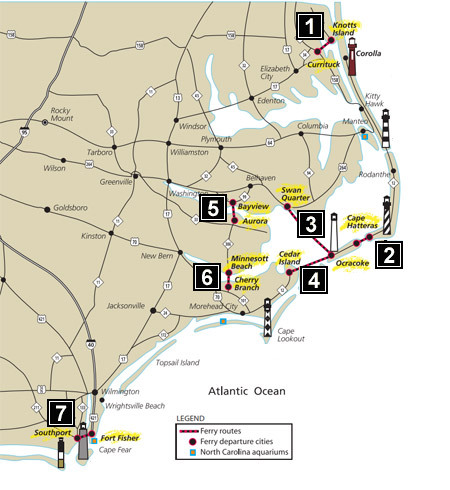 The NC DOT operates three different classes of ferries to help transport visitors to and from the Outer Banks. If you have ever missed a ferry you know how important keeping with the North Carolina ferry schedule can be. Waiting a couple of hours is likely and an overnight detour is always a possibility. Knowing the NC ferry schedule ahead of time can really make a difference on your next trip, if you find yourself on the road ferry schedules are also available by calling 1-800-BY FERRY.